...Just a little piece of my world and my creations! This earring design is new to my Etsy shop! 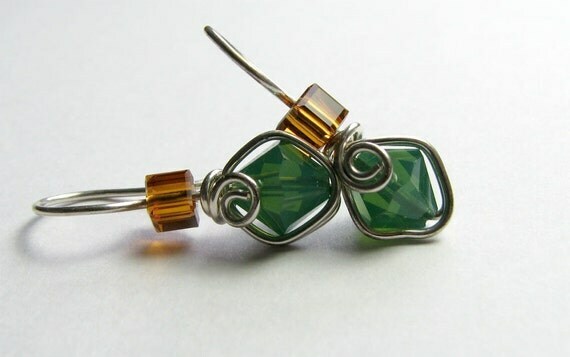 Hand swirled sterling silver wire with a generous gemstone dangle to beautifully frame your face! These are currently available in Canadian Jade, Angelite, Amethyst, Pink Opal, and Black Labradorite. A friend of mine is hosting a holiday open house in her shop, (more on that later), and invited me to display my jewelry. 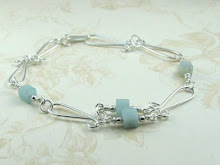 I wanted to create something new, yet in keeping with my wrapped bead look. Playing around, this is what I came up with. I love the look so much, I couldn't wait to get some in my Etsy shop! Which gemstone is your favorite? 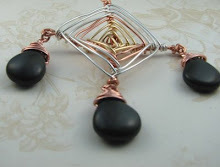 Which gemstone would you like to see dangling from these zen like wires? Share in the comment section! BTW: My favorite are the black labradorite earrings. The black and silvery beads resemble a full moon, and have a dramatic feel wrapped in sterling silver! New, wire wrapped cultured sea glass studs can be found in my Etsy shop! These are so cute, and have been quite popular so far, this holiday season! Available in various colors, and in sterling silver and 14K Gold! Okay, you love handcrafted earrings, however, you prefer to wear a stud earring for work, or just don't care for dangle earrings...Never fear! Pixe is here! I offer wire wrapped stud earrings in my Etsy shop! 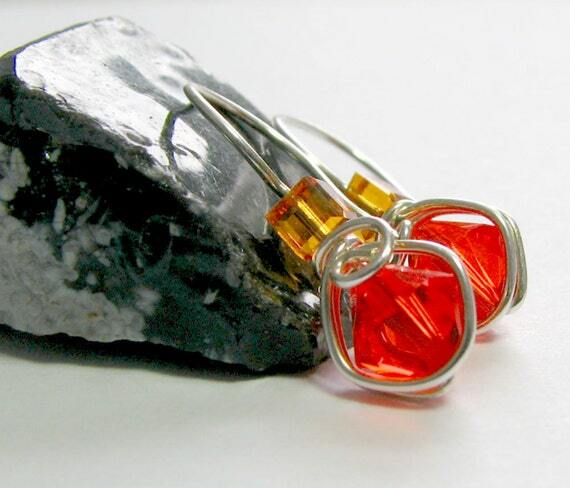 These two are designed using tiny, 4 mm cube shape beads. Sweet, petite, and unique! Custom orders are more than welcome! Let me know if you have a particular stone or Swarovski Crystal you would like wrapped! Rounds and cubes work best! You can contact me through my Etsy shop or direct email! I wish you a fabulous, and peace filled day! Peridot is found in various shades of green, and it is the birthstone for August! 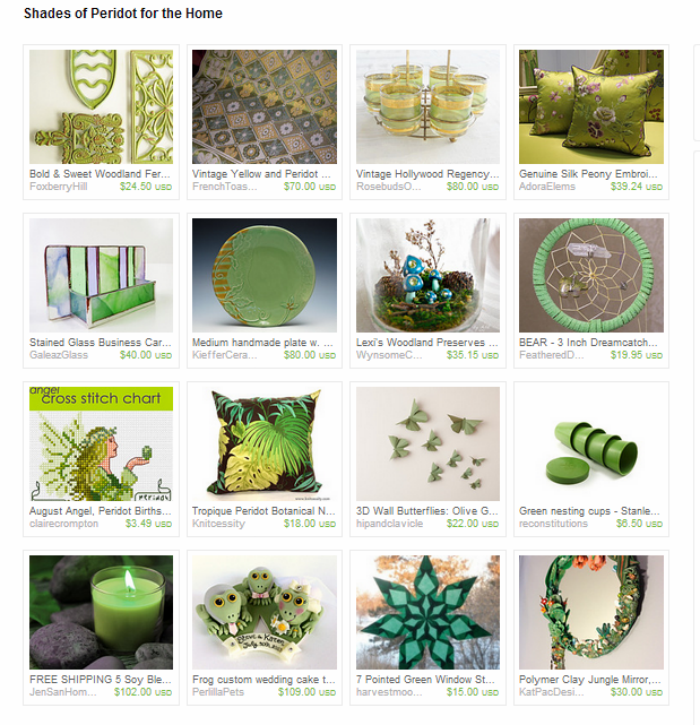 I found these beautiful shades of peridot for the home on Etsy! Click the caption below the Treasury to taken to it! I love Etsy Treasuries! It's such a fun way to meet new artists and their work! 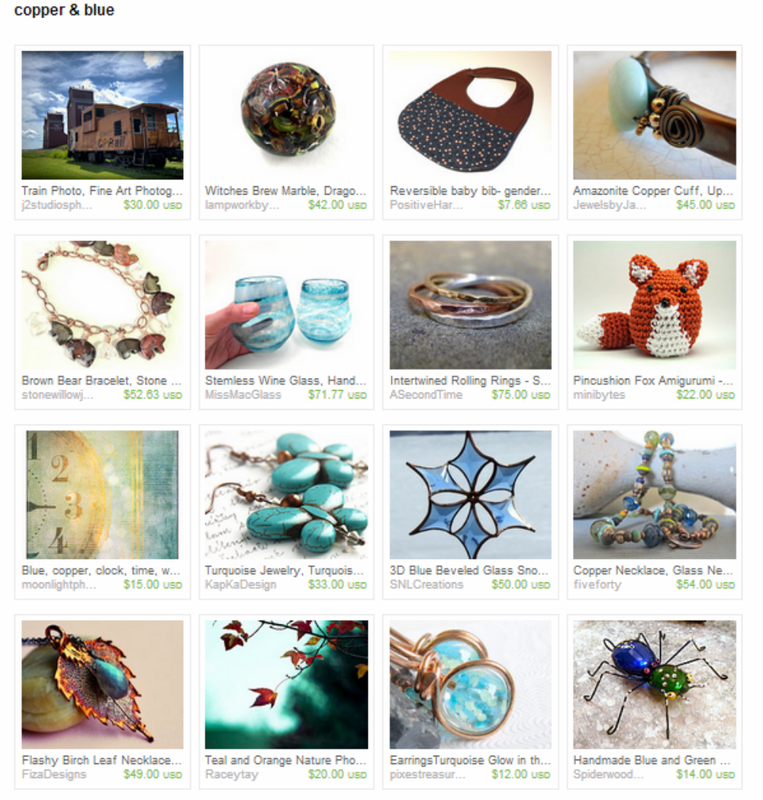 My turquoise and copper glow in the dark earrings were featured in this Etsy Treasury, Copper and Blue! Take a look, it gorgeous! Also, while you are there, visit mosaicsbymargo , the curator of thisTreasury! 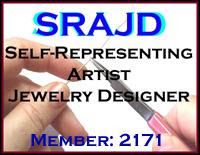 She offers a beautiful collection of mosaic art, mosaic mirrors, suncatchers and spoon pendants, and more! Her shop is beautiful! While you are wandering around Etsy, visit the shops of the artists featured in this collection! You will find some great stuff! This morning I was out of the house early, all bright eyed, and bushy tailed, looking forward to attending an estate sale this morning. Stopped at the Wawa for some iced tea, and the ole Pixe Mobile left me sitting. Ran into my neighbor there, he tried to jump start it. Nothing. Thank goodness for AAA, that has got to be the best $45 I spend! The tow truck shows up, after I gave my garage a heads up that my car will be towed in, and in less than 5 minutes my car is running. I thought it would be my starter, turns out, the connection was loose on the battery. Gotta love an easy fix. Now, admittedly, I don't know much about cars, however, I don't think this is supposed to be part of my engine! Yes, it's a nest...I think a mouse nest. I poked around with a stick and nothing poked back (thank goodness!). So I removed as much as I can, and vacuumed the rest out. I wonder how many of my neighbors saw me vacuuming my engine, and wondering what the crazy lady is doing?! So, next time the car leaves you sit, and you suspect the battery, be sure to check for loose connections, as well as corrosion at the battery terminals. Gotta go now, and put my extra wrench in the car, just in case!